Those last few LINE messages you received were not in fact SPAM, but instructions on how to join a special LINE pop-up store at Hysan Place. Much like the popularity of Angry Birds, cute characters found only in mobile phone apps are rapidly becoming sought-after stars in merchandising. 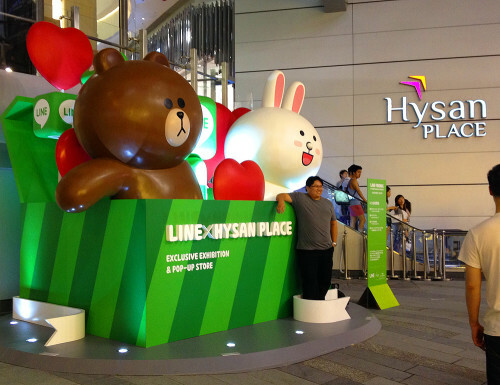 Walking by Hysan Place over the last week you may have noticed a large crowd gathered around taking photos with characters known to users from LINE, the mobile messaging app from Korean company Naver that is popular in Japan and Hong Kong. Users of the app utilize the characters to express a wide range of situations and emotions by inserting an image into a conversation from one person to another. You can think of them as a souped-up version of an emoticon. However, instead of a simple smiley-face, they can convey a variety of complex feelings, both in static and animated images. The characters, Brown (the bear,) and Cony (the rabbit,) are called ‘stickers’ in LINE parlance, and have turned out to be a major attraction. For all the years that people scoffed at the idea of virtual idols and stars, believing that they could only work in Japan, it’s actually happening right as we speak internationally, via mobile apps. The characters are used on a daily basis by millions of people throughout the world, and have become a differentiating factor in the battle of the messaging apps. This is the power of the mobile Internet at work – the characters are popularized via a communications platform that people use exclusively via their phones. The amount of daily use of these apps among certain demographics allows users to build both a relationship with, and an affinity for the characters. Messaging apps essentially form one of the pillars of modern communication. Millions of people engage with these characters on a daily basis. A silly dancing rabbit sent from someone you care about can brighten up your mood for an entire afternoon. LINE has always been more elegant, fun, and in tune with Asian sensibilities, than the rather stodgy Whatsapp. 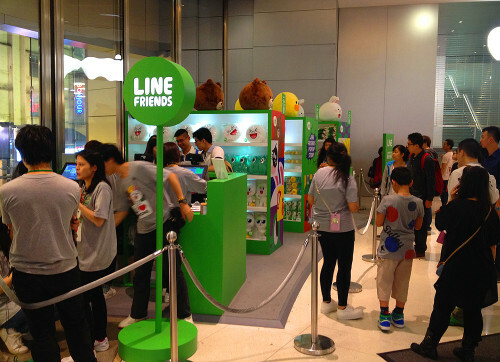 Although WeChat has moved ahead in certain areas such as e-commerce functionality, LINE provides a more detail-oriented user experience, which has made it most popular in Japan. Plus it has way better stickers! When virtual characters enter our physical world it fascinates us. 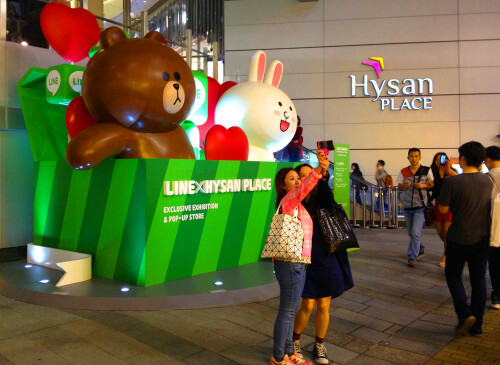 At Hysan Place, people take turns running up and shooting a quick photo in front of the display, or squeeze in for a selfie with a friend or two. Upstairs in the foyer of Hysan Place, the pop-up shop is only accessible to people who have followed the instructions to register. As the uninvited passerby covet the items from behind velvet ropes, cash registers sing with the real-world profits derived from digital characters. 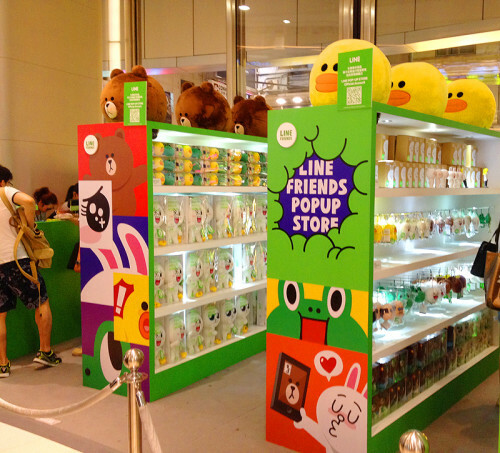 The LINE pop-up shop is branding, user-engagement, and merchandising all rolled into one. While WeChat has taken out highly visible ads in front of the Cross Harbour Tunnel, and placed posters in the MTR, LINE’s pop-up has more intimate engagement that spreads across a user’s social graph organically. 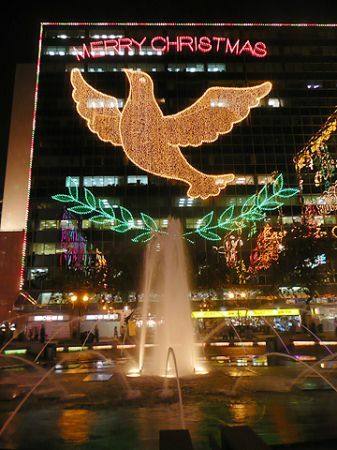 ‘Tis the Season… already? Christmas 2008! 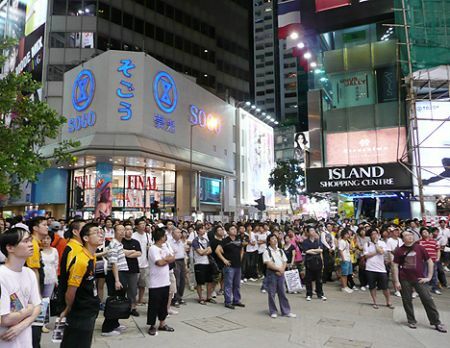 Previous articleHello Kitty fans invade Causeway Bay! Next articlePigalle x Nike launch rocks H.K. !